Powerful, dependable, manageable and secure... ThinkCentre M910z AIOs boost your organization’s efficiency and productivity. 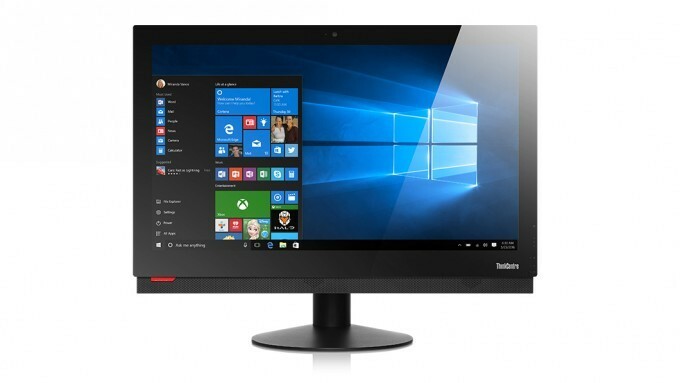 Packed with the latest Intel® up to Core™ i7 processor and vPro™ technology, Lenovo ThinkCentre M910z AIO is built for enterprise. With PCIe SSD and Intel® Optane™ technology*, M910z AIO enables you carry out intensive task with ease. MIL-SPEC tested, meaning your AIO can still be reliable even in the most challenging environments. Plus built-in data security – these easy-to-use machines keep your workforce on task, and improve productivity. Basic monitor stand, tilt only with -5 degrees ~ 45 degrees. Lenovo AIO Privacy Filters utilise patented 3M microlouver privacy technology to darken the screen at specific angles so as to block wandering eyes from viewing your screen while you work. For the AIO Privacy Filter, Lenovo offers a product that works for both touch and non-touch AIO systems, utilising new thin privacy material. Privacy filters’ key benefit for companies that work with client data and information is that they provide the first line of defence against visual hacking, protecting private information from being hacked by onlookers. Using headsets in the office is a key part of the modern workday. VOIP calls are quickly replacing traditional phone services and helping companies save on big telecom costs. Comfortable fit, mono or stereo designAdjustable headband and boom microphone180-degree microphoneModels that fit either the 3.5 mm jack or USB port in your notebook, workstation or tablet.